Yes they are named after THAT Beatles album. 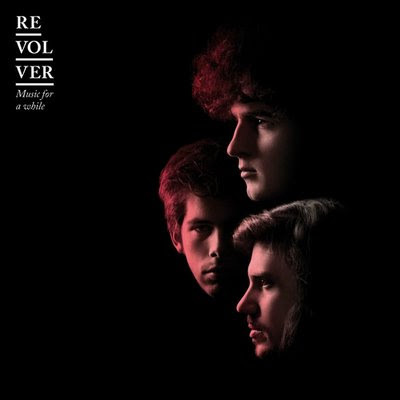 Revolver are three twenty something classically trained Parisian men: Ambroise Willaume (lead vocals, guitar, piano), Christophe Musset (vocals, guitar) and Jeremie Archache (cello, vocals) who began playing together as a band in late 2006. Willaume happened to see his friend Arcache performing at Notre Dame. 'He was improvising a Haydn concerto for cello. He was playing like Jimi Hendrix. He didn't even know The Beatles or the Stones by name! Willaume and Musset, keen to involve Arcache in their musical plans, gave him a list of essential albums to listen to : Sgt Pepper, the Velvet Underground, Elliott Smith's Either/Or, the works of Bob Dylan." And so Revolver was born. EMI signed Revolver after listening to their MySpace page, this was quickly followed by the release of an EP called 'Pop de Chambre' in France and the US. The name of Revolver's debut album is a tribute to Henry Purcell: 'Music For A While' is the title of one of his most famous pieces of music. Released date: June 23rd, 2009. Baroque indie-pop, mellow vocals esp. harmonies, catchy melodies, a French Beatles. I love that track, but I can't find it on the USA version of iTunes or on the Amazon MP3 store. Any idea where I can (legally) acquire the album (preferably digitally)? I've just an email to Revolver's management to see if they have any suggestions, I'll let you know if I hear anything back.